I don't own them, but have heard from others with 'em that they will attack meat. They also ate fruit and stuff though. I suggest that you try vegetables. My hissers love green beans, lettuce, and broccoli. These sometimes need to be aged in the enclosure for a little while first, and well hydrated. I'm assuming giganteus eat the same things as hissers, though. I hope you find out, because I might get some. I've got them, (one of mine is my avatar) they eat quite a bit of things. They also drink alot of water. Wow. Mine hardly drink water at all. It might be the humidity though, I keep it around 70% for them with daily misting, heck they are probably drinking the water from the misting more then the gel. I picked up some hamburger last night...I will cook it up for them for tonight. I'm certain colonies can be maintained for decades on only dog food and apple. If you don't have very many they don't eat very much. Variety is always better than the same thing, especially for good breeding and healthier roaches. Also, adults eat differently than nymphs, so that could be why some havent eaten many of the fruit, just keep trying eventually you'll see them eat. Misting will provide them with plenty to drink, so your doing great there. ...Meat is bad for roaches. In the long term it can cause hyperketosis. In the short term it can cause them to carry salmonella which affects people. It is difficult for them to digest so it can also cause blaoting in some specimens and lead to death and/or slow procreation. Occasionally you can have some luck keeping them with some meat, but the expense and effort is rediculous. B.giganteous does not eat as much as other Blaberus, like discoids or atropos, so one should not try to feed them like the others. Mine have been doing very well on fish food and the occasional piece of fruit or carrot. Variety is not necessarily good for inverts as it is for mammals. I've had my giganteus for over 2 years and they get meat once in a while, so it cant be bad for them unless someone is feeding them meat only or everyday. If it was bad I wouldnt have any roaches right now. Second, no, I dont only give the meat, they get there fruit and veggies everyday. They'll get meat once a month, if that. It's no expense because if i'm having meat for dinner, I had to cook the meat anyway for myself, so it's no extra work for me. And the meat is plain, no salt or spices or anything. MOST IMPORTANT Whether your feeding them meat or not, you should ALWAYS wash your hand thoroughly after, thats common sense. Blaberus eat dead bats if the area they live is a cave, bats are meat, raw infact. You dont see the wild roaches dying from it. I think that giving them a little meat is okay. If you fed it to them exclusively it would lead to excessive keytone bodies. On the flip side, I think putting roaches on an Atkins diet is not going to work. Do insects have the same blood/brain barrier as mammals? With an open circulatory system I wouldn't think so but that doesn't mean that their brain's metabolism wouldn't function the same as a humans. I'm no expert on insect biochemistry though. Meat couldn't be all that bad for them since the vast majority of fish food out there is made mainly of fish meal, zooplankton, and other "meaty" products right? Everybody here sings praise for different fish foods for different species (I know I do). I think that if you fed your roaches raw meat then bad strain salmonella could cause problems though (Do roaches have salmonella as part of their gut flora like humans?). I think that for the omnivorous species of roaches it would be very beneficial to offer up some high protein snacks since ammonium carboxylates are needed in a lot of different functions (like proline for the cuticle and others for signaling molecules...). Maybe for specialized invertebrates that have specialized diets, like some roaches, then variety wouldn't make a bit of difference as long as they are getting what ever foodstuffs they have become specialized in. But if you have an omnivorous species as a pet then provide an omnivorous diet because there is a reason they eat what they do. That’s only my take on it though. But oh, this did make for interesting posts/conversation and learning material! Also, Keith, not to keep pointing out your post but it brings up an excellent example. You say you feed meat "once in a while", which is not regularly, which I may have tried to state previously. Roaches can eat glue also, but you probably dont feed that "once in an while" either, right? 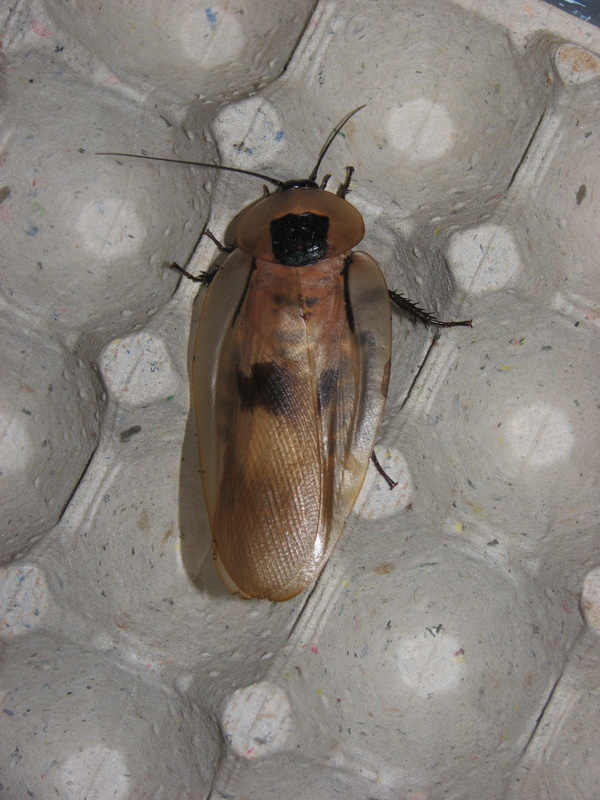 My point is that if anyone is interested in keeping thier roaches at thier peak of health and productivity, why would you not choose to feed them them most volume of the least expensive material that most closely matches "normal" roach diet? That is just common sense... like washing your hands. My personal opinion is that feeding meat to roaches is just rediculous. It does not benfit anyone or any species of roach, and it is far from cost effective despite its convenience. Anyone- as far as fish food goes it does have alot of protein in the form of fish meal. It also contains as much rice and/or wheat product. Combine that with fruits and veggies and you get a diet that is mostly plant matter with some flesh product included. Again Keith- try not to take any post as a personal attack. Chill out, no need to be defensive on a forum. This is all just talk and opinions on the internet. Matt i'll keep this short. I feed my roaches BOTH fruits and meat. Some have lived over 2 years and still going, so whatever im feeding them seems to be doing nothing but good. In the wild roaches have the opportunity to eat baby bats that fall to the cave floor, yes rarely adults. And they eat the fruit droppings. So how is the diet im feeding bad, you got me puzzled there, as it is what they would normally eat. Not to mention wing biting isnt an issue, the extra protein prevents that, another reason why meat is good for this particular species. If your willing to give them a good diet, the payoff is better than the cheaper diet where they dont live as long and have more offspring fatalities. If your breeding them for selling, even more reason why they should be healthy. So do what you want, but I stand firmly to what i've stated and so have the people before me who bred there roaches of this species on this diet. AGAIN THANKYOU ALL YOU ARE ALL SO AWESOME AND HELPFUL!!! Mine really didn't like the hamburger much, I may have over cooked it. But I just saw another batch of babies. They really seem to dig the frozen thawed pinky rats and mice ,so since that is working for me I think I will continue to use it. I buy in bulk for my snakes so it is not much an added expense. Just FYI, I am only feeding 3-4 FT pinky rats/mice at a time( every 10 days is what I plan) and removing the very small amount that is left ( not even recognizable as a rodent carcase, they even seem to eat the smaller bones!!! !probably going after the marrow ) within 36 hrs of putting it in there. I do feed fruit and vegis but those they just seem to nibble on very infrequently. Again I can't thank you all enough for you help and I was shocked at the amount conversation this generated. If they do not have them than there is very high mortality during molting from subadults to adults. If you will feed them by fruits or vegetables only .... you will have a problem. Apple and corn based dog food have successfully maintained a colony from 1972 to 2014. The problem with using meats is it's not necessary, can be overly expensive, and most importantly could lead to illness of the keeper from uneaten rotting portions and frass. Corn based dog food............ hmmmmmmmmm , so I guess my question is ......... am I wasting my money on the expensive organic dried cat/dog food mix or is Walmart Alpo $10 for 50lbs just as good ? Just my two cents...I feed my colony the cheapest dry dog food in the big 40-50 pound bags. That is all they get. I have had my colony for many years. FYI: One of my favorite roach species. Carrot, peeled to make it "safe and organic"
Fish flakes, this is expensive but I merely use it in small amount for fun, just like giving candy to kids. I haven't had them very long but they seems happy, without any "mysterious die-off after molting to adult" yet. Hell yeah you're buying organic food for you're bugs!?!?! I got to hand it to you you have dedication do that! The cheap stuff works fine.